Back in April, I covered the theatrical release of Tom Hooper's adaptation of David Peace's controversial book here and therefore I'm not going to rake over the embers of that review on this occasion. Suffice it to say, I think it's a terrific film but it is tonally quite different from the brooding, darker view of Brian Clough that Peace unearthed in his novel. 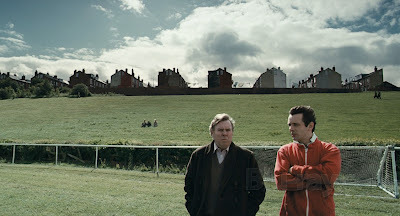 The film is most definitely worthy of your time simply for the central performances from Michael Sheen and Timothy Spall as Clough and his co-manager Peter Taylor. Looking at this on Blu Ray recently certainly reinforced the visual style of the film for me and it's worth revisiting the film in the HD format just to have the chance to reappraise director Tom Hooper's vision of the period and his compositional style. I would certainly suggest you listen to the fascinating commentary with Michael Sheen, Hooper and producer Andy Harries as it does provide anecdotal material about the production of the film, about how Sheen became Clough and an insight into Hooper's notion that in fact it is visually a film more about Britain, and the North in particular, emerging from the clouds of post-war hardship than it is about capturing the 1970s. This intention is clear because the film avoids that rather easy trap of recreating the 1970s from a rag-bag of cliches that we've seen too many films and television series do. Stylistically, it feels more akin to the recent Red Riding Trilogy as seen on Channel 4 than it does to, let's say, Velvet Goldmine. Granted it's about the world of professional (or unprofessional, judging by the antics of the Leeds team of the time) football and not some hyper-realist vision of Bowie and Iggy. Picture quality is very good, the 1080p transfer coping rather well with lots of very dimly lit interiors, the washed out colour palette and the integration of archive footage. It's a clean, crisp transfer with great detail but it isn't the kind of film that you would use as a particularly knock-out demonstration of high definition. It's perfectly acceptable. The film is accompanied by a Dolby TrueHD 5.1 soundtrack which, although it won't stretch your system, does add a very atmospheric ambience to the visuals. 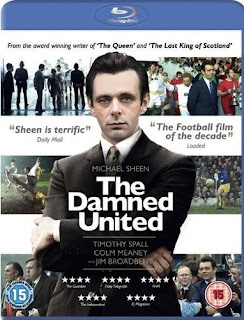 As Sheen, Hooper and Harries emphatically state in the commentary, the film is about a marriage between two men, a partnership that suffered because of Clough's obsession with outdoing his rival, Don Revie. They also share with us the difficulties of getting permissions to film at the grounds and their worries about how Clough's family and the surviving team members would receive the film. Perfect Pitch is a very servicable 'making of' featuring screenwriter Peter Morgan, Andy Harries and Tom Hooper taking us through the development of the film and the script and casting Michael Sheen. It's also a fascinating glimpse at how the crew recreated those old football grounds. Michael Sheen discusses his portrayal of Clough in Creating Clough. He also has some interesting views on how the rivalry with Revie and the disaster of managing Leeds may well have led to his triumph with Nottingham Forest. In Remembering Brian various former players, Sheen and former TV journalist Austin Mitchell offer a tribute to Brian Clough. The Changing Game: Football In The Seventies pretty much does what it says on the tin and offers a discussion about the way the game has changed with former players, Mitchell and Dr. Jon Dart, Senior Lecturer, Leeds Trinity & All Saints. Long before computers mucked everything up, fantasy movies relied on very hard working visual effects technicians to transform conceptual drawings into fully realised worlds. If you are a child of the mid-1960s then the names of Ray Harryhausen, Les Bowie, Tom Howard, Wally Veevers, Roy Field and Brian Johnson will always fill you with nostalgia for a time when fantasy had to be hand-made, built physically on a stage or in a model studio. Watching The Dark Crystal reinforces this view. Jim Henson arguably pushed the possibilities of puppetry and animatronics to new heights throughout the latter half of his career and his legacy lives on in his son's work in series such as Farscape where the integration of puppetry with live actors come into its own. He and his father will also be cherished for their work in light entertainment with The Muppets and education with Sesame Street, both of which endure to this day. 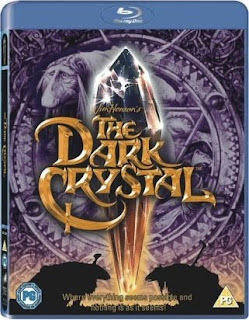 However, The Dark Crystal doesn't quite get into the list of best remembered films of the 1980s and that's because it's an oddly disjointed film. It looks utterly wonderful with a superbly realised world for the characters to inhabit, beautifully designed, in the main, by fantasy artist Brian Froud. For Henson it was clearly an opportunity to stretch himself creatively and have a much wider palette to use to tell his story and he surpasses himself with the visual aspects of the film and with some of the characters. It is a very simple tale of good versus evil, set against each other when an all powerful crystal is cracked and splits this world into two. Good is represented by the peace-loving forest dwellers, the Gelflings, and the silent Mystics and evil is personified by the Skesis and their army of Garthim, ruling from a palace that houses the crystal. The remaining Gelflings, Jen and Kira, must go on a quest to repair the crystal by returning to it a missing shard. Only then will balance be restored. As the Gelflings go about their quest, the story is populated by all manner of visual business. It's a very busy film, with things happening in the corners of the frame that are easy to miss. It's this inventiveness that makes the film appealing and not the two central characters, Jen and Kira. They're not particularly well developed, coming across as rather bland ciphers in the story. Only at the end of the film do you feel that Henson and fellow director Frank Oz have achieved some good dramatic tension with the two Gelfling characters and it is too little too late unfortunately. But the film is kept interesting with the hideous Skesis, weird lizard like birds of prey taken to raiding the dressing up box and coming across as a seedy, rather cruel bunch. It's here that you get the feeling that Henson and his crew concentrate their efforts and they make the Skesis a memorable bunch of villains, especially the double crossing Chamberlain, by combining great, well observed, physical motion with appropriately funny voice talents. My favourite character is certainly Aughra, the one eyed prophetess, who really comes alive through Billie Whitelaw's vocal performance and through her combination of looking like a hog, your great aunt Bessy and a fairground fortune teller. Love the way she can remove her one eye and using it as a bugging device! It's still quite a scary number for small children and I would think the scenes where the Garthim, huge beetle like creatures, attack the friendly folk of the forest or ambush Jen and Kira on their landstriders would be a little too much to take for the more sensitive youngsters. The scary bits are complemented by the film's decidedly mystical overtones which do add an epic dimension to the storytelling. The film is assisted in this by Oswald Morris' beautiful cinematography where he deftly manages a striking colour scheme for the interiors of the palace and the chamber of the crystal as well as the fascinating forest journey undertaken by Jen and Kira. For this Blu Ray release I don't think I've ever seen the film look better. Not only did I see it in the ratio it was originally presented in, at 2.35:1, for the first time but it looks brighter and sharper too. Detail is very good, perhaps too good as you do see strings and other bits of the puppetry that you obviously shouldn't, and the colour is vibrant but the picture is not without flaws, being sometimes quite soft, the contrast occasionally varying between a satisfying depth and over-bright murkiness. The sound is presented as a Dolby TrueHD 5.1 lossless soundtrack but despite this the soundstage isn't used to its full possibilities. There is also a rather domineering score from Trevor Jones and even though it is quite excellent in and of itself, it's not used subtly here. Packed with some interesting extras, including quite an in-depth commentary from conceptual artist Brian Froud, a vintage documentary (made for television, I presume, in 1982) The World of The Dark Crystal that uses its hour long running time to delve into the development of the film, the characters, the puppets, the sets and the production. Lots of interviews with the principle makers and great behind the scenes, on set, footage. Reflections of The Dark Crystal is presented in two parts, with Light on the Path of Creation examining the themes, designs and the legacy of the film and Shard of Illusion putting puppetry and story development into context. There is also some good interactivity on the disc with a picture in picture Storyboard Track -- Picture-in-Picture that presents development vignettes from Froud, production designer Harry Lange and other technicians and artists who worked on the film; a crystal icon that operates the The Book of Thra - Dark Crystal Collector as a kind of production info track throughout the film; and a trivia game SkekTek's Crystal Challenge.